Health Communications Inc, 9780757316463, 264pp. "Whether you are a professional who treats veterans and their loved ones, or a person at risk for military PTSD, or anyone who cares, you will be profoundly moved by this eloquent memoir." —Frank Ochberg, MD, award-winning mental health expert who helped define the term "post-traumatic stress disorder"
"An incredible memoir . . . an important part of the still unhealed wounds of war. Christal has given as much of her heart to this story as her father gave to his country." 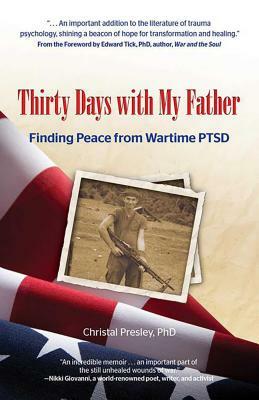 "Thirty Days with My Father is an important addition to the literature of trauma psychology, shining a beacon of hope for transformation and healing." "To me, post-traumatic stress disorder was just a bunch of words. All I knew was that it had something to do with my father's brain, and he seemed to be going crazy. And I knew it was bad because my mom told me that if anyone found out how sick he was, they'd come and take him away forever, and they'd take me away too, and she couldn't live like that. If he had to be that sick, I wanted him to have something everybody could understand. So I picked brain cancer." When Christal Presley's father was eighteen, he was drafted to Vietnam. Like many men of that era who returned home with post-traumatic stress disorder (PTSD), he was never the same. Christal's father spent much of her childhood locked in his room, gravitating between the deepest depression and unspeakable rage, unable to participate in holidays or birthdays. At a very young age, Christal learned to walk on eggshells, doing anything and everything not to provoke him, but this dance caused her to become a profoundly disturbed little girl. She acted out at school, engaged in self-mutilation, and couldn't make friends. At the age of eighteen, Christal left home and didn't look back. She barely spoke to her father for the next thirteen years. To any outsider, Christal appeared to be doing well: she earned a BA and a master's, got married, and traveled to India. But despite all these accomplishments, Christal still hadn't faced her biggest challenge—her relationship with her father. In 2009, something changed. Christal decided it was time to begin the healing process, and she extended an olive branch. She came up with what she called "The Thirty Day Project," a month's worth of conversations during which she would finally ask her father difficult questions about Vietnam. Thirty Days with My Father is a gritty yet heartwarming story of those thirty days of a daughter and father reconnecting in a way that will inspire us all to seek the truth, even from life's most difficult relationships. This beautifully realized memoir shares how one woman and her father discovered profound lessons about their own strength and will to survive, shedding an inspiring light on generational PTSD. Christal Presley, PhD, is the founder of United Children of Veterans (), a website that provides resources about post-traumatic stress disorder (PTSD) in children of war veterans. She obtained her PhD in education in 2009, and is an instructional mentor teacher in Atlanta Public Schools. This is her first book. Thirty Days with My Father is an unforgettable account of a daughter struggling to find connection with herself and her father in the aftermath of war. Christal Presley's memoir is a truly inspiring portrayal of survival, forgiveness, and love. "–Jessica Handler, author of Invisible Sisters: A Memoir.